November 30 marks the end of the Atlantic hurricane season. A season that in 2017 cost billions of dollars because of storms like Harvey, Irma, and Maria. Months after landfall, serious cleanup and recovery continues in places like Texas, Florida, and Puerto Rico. AIR Worldwide, a Boston-based company keeps track of it all. 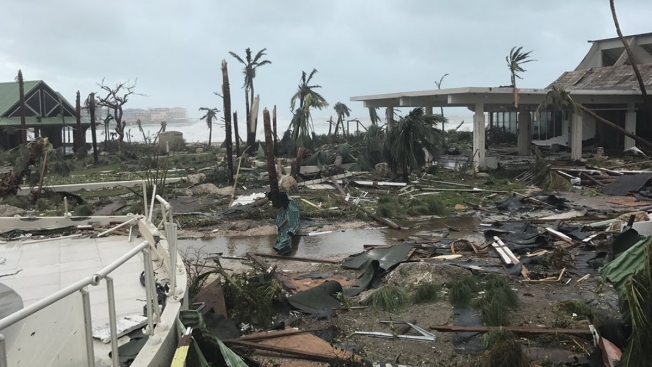 That company predicts storm losses for insurance companies—predictions that can help property owners after a hurricane hits. Peter Sousounis is the director of meteorology at AIR Worldwide, which creates catastrophe models. When Will We See Snow in Boston? With this data, insurance companies can plan ahead, benefiting homeowners after disasters strike. “Mobilizing claims adjusters, knowing if they’re going to tap into their re-insurance to cover some of the losses,” Sousounis says, in reference to what is essentially insurance for insurance companies. Sousounis said the models performed well this year. In Harvey, AIR Worldwide used both its hurricane model and flood model to figure out that while economic losses would be as high as $75 billion, insured losses would only be around $10 billion, since so few policies covered flooding, the main source of damage. From Irma AIR Worldwide says insured losses are closer to $35 billion in the United States, but it could’ve been worse. “Had it run a track that was closer to the east coast it would’ve been a $100 billion storm,” Sousounis warned. In the future there will be storms that follow a path up the coast. Maureen and Bob Piccarelli of Wareham know that all too well. “The water flooded right up through the town, a lot of the buildings, you know, water almost up to the top,” Maureen says of downtown Wareham, while sharing details of the Great Hurricane of 1938. That was a Category 3 storm that killed 600 people in the Northeast. Maureen’s street, where her family has lived for decades, sits high enough where it avoids most surge flooding. Other neighbors nearby aren’t so lucky. Their homes suffering flood damage during even less powerful storms, like Bob in 1991. In that storm water came up to the foundation of a home right on the water in Wareham. In a worst case scenario, a storm like 1938, a surge of more than 20 feet could nearly overtake the same home. “That storm looks to be, at least in our modeling framework, looks to be about a hundred year storm,” Sousounis warns. That means in any one year there’s a 1% chance of it happening. The insured losses would be staggering. “It’s about a $50 billion U.S. loss,” Sousounis calculates. For some perspective, a $50 billion storm in New England would rank it among the 10 most costly, in terms of insured loss, to hit the United States according to AIR Worldwide, just behind storms like Andrew and Katrina.